When our college freshman was in elementary school, she decided she wanted to start her own cosmetics company. Alas, that venture never got off the ground. But it is not forgotten: In an early phase of trying to create a company website she provided her name, her company’s name, and our home address to a web-hosting service, all of which was sold to a mailing list. Over 10 years later, she still receives offers every few weeks to accept a company credit card or to apply for a loan as CEO of her would-have-been international cosmetics empire. Now, as a college student, our once and future entrepreneur has also started receiving offers from new companies who want to lend her money as a prospective life-long customer. In fact, many of the credit card offers include “College Student” as part of her address. It must be an empowering feeling for an 18-year-old, right? Money is EASY to get! However, I think most of us realize that while money may be easy to get—at least for a little while—it’s a lot harder to MANAGE. And even though controlling your own finances is a critical life-skill, the fact is very few schools carve out meaningful time to teach students about money. As a high school educator, over the last 25+ years I have watched several thousand teens cross the graduation stage without having received much, if any, formal, explicit instruction on managing their own personal finance. So, don’t kids figure out all of this for themselves? Maybe not. Last July, USA Today reported that a third of Americans are delinquent on debt. In August, WashingtonPost.com reported that 20% of Americans nearing retirement age have ZERO savings. That’s not the life I want for my kids—or for anyone else’s. But the good news is that the need to teach teens about handling money IS starting to draw genuine attention. For example, the Jump$tart Coalition for Personal Finance Literacy is working nationwide to increase opportunities for teens to learn about managing their money. 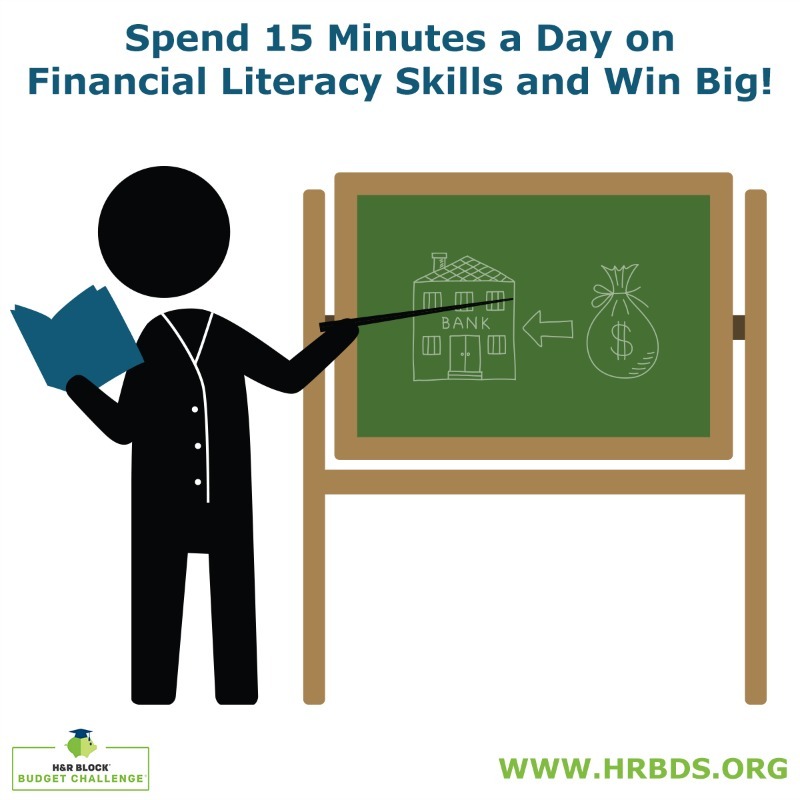 Many states, including my own (Maryland) are implementing new standards for financial literacy. But this content needs real attention—it can’t be just ‘one more thing’ for teachers….we have too many of those already. So schools need strong resources. Your child’s teacher registers the class for the H&R Block Budget Challenge. Visit hrbds.org. The students take on responsibility for tasks they will face as adults, such as (1) paying bills (on time! ), (2) setting aside savings, (3) investing for retirement, and finally (4) paying taxes. Students can check their progress online on managing their personal finances at any time. High-scoring classes win grants, and top-performing individual students win scholarships. The cost for all of this? FREE! To register your class, or for more information to share with your child’s teacher, administration, or PTSA, visit www.hrbds.org. Instruction on teens personal finance: It’s important. It’s overdue (sorry—couldn’t pass that up). 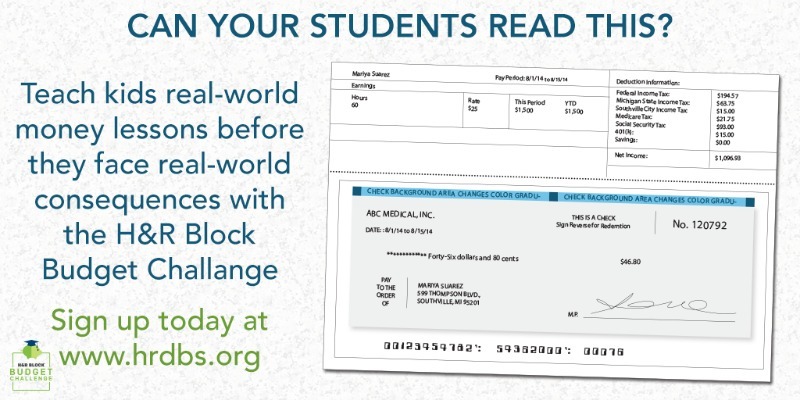 And the H&R Block Dollars & Sense Budget Challenge provides an engaging way to make our kids “Real-World Ready.” Sign up your class for the H&R Block Budget Challenge here!